I still get requests for acrylic templates for POTC. I don’t recommend them or sell them for any design. It took me several days to write this because I needed to reconsider some strong language. In the end, I decided to vent. I have been holding this in for years. The info in this article is useful whether you use Inklingo or not. Some quilters will resist the message but it will set other quilters free—to dance along a more creative and satisfying path. New subscriber? I don’t normally vent like this. I hope you will stick around to see what I post next time too. 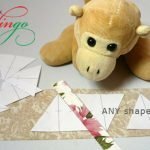 Of course, I think Inklingo is the best tool available to quilters today but even if you do not use Inklingo, you never, ever, ever need acrylic templates for any design. Knowing what I know, it would be disrespectful to sell acrylic templates. My mission is making quilting more accessible for everyone and there is an inexpensive, more useful alternative that gives you the freedom to make ANY design. You don’t need acrylic or Inklingo! Since the introduction of rotary cutters in the early 1980s, designers have promoted acrylic templates for absolutely everything. At first glance, it looked like a big upgrade from using cereal box cardboard and it has proven to be an easy way for designers to make a little money. Unfortunately it does not benefit quilters. Many of the businesses that sell acrylic templates have talented designers who create wonderful designs and write excellent instructions, so it baffles me that they continue to promote acrylic. They can do better. In fact, acrylic templates have been promoted so heavily that some quilters automatically assume they need them for every quilt. However, acrylic templates are one of the worst tools available to quilters. A few illustrations make it obvious. I recommend using freezer paper templates in the FINISHED size. Add the seam allowance when you cut the fabric with a rotary cutter OR scissors. Working in the FINISHED size makes every step easier, including designing. In fact, it allows you to make templates in any shape, any size. It also makes the cutting and sewing easier. Anything you can draw (or print) on freezer, you can cut apart and put together again. A drawing of the complete block is all you need. Be creative. Draw it. Trace it. Print it. Your choice. Add or remove lines to suit your own style. Freezer paper templates are inexpensive, flexible, available on the spot. No need to pay postage and wait for a piece of plastic to be delivered. You can have ANY shape, any time, anywhere, right now. All you need is freezer paper and one acrylic ruler. Cut single layers OR cut several layers at a time, as demonstrated in Live Video 08. Each template can be used over and over and over and over again. 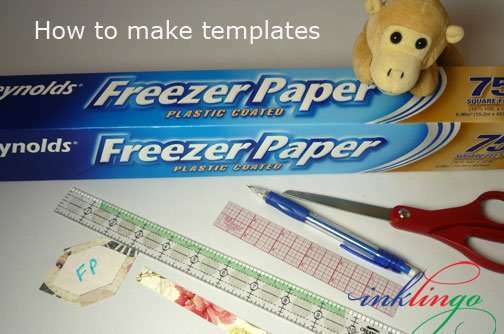 You can write on freezer paper templates, store them in envelopes, and have as many as you want. They can be enormous or tiny. It is the sewing line that is important. Adding drilled holes to acrylic templates is what Monkey calls a “gratuitous invention” or a “negative improvement.” Acrylic templates created the problem. Drilling holes does not solve it. Fussy Cutting is fabulous with freezer paper templates. No more peering through thick plastic that wants to slide. Have as many templates as fussy flowers to be cut, not just one to move around. I have written detailed instructions for fussy cutting with freezer paper templates several times on the blog, so I won’t repeat it here. With freezer paper templates, YOU decide on the amount of seam allowance you want. The width is entirely up to you, so when you are sewing tiny pieces, you can use less than 0.25 inch and in other cases, you might want something wider than 0.25 inch. 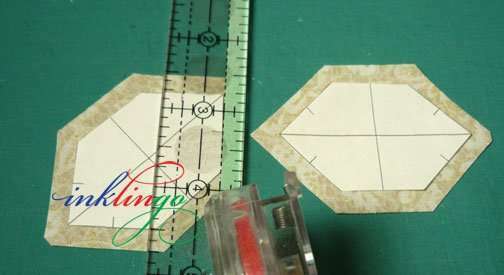 Acrylic templates are intended to be used for rotary cutting, so if you want to cut with scissors, you are instructed to draw around the acrylic to mark the cutting line and use dots to mark the seam endings. Good grief! This is the exact opposite of what you actually need. 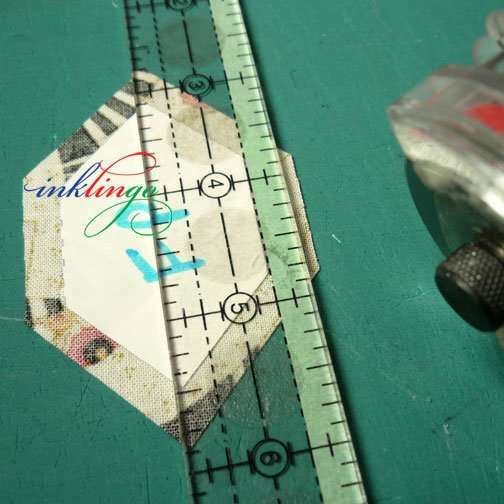 It is better to use a template in the finished size, so you can mark the sewing lines, when required. That is what is important. You can eye-ball the seam allowance when you cut with scissors. I think you will be amazed how quickly you train your eye. TIP If you don’t trust yourself to cut an accurate 0.25 inch seam allowance (yet) with scissors, you can train your eye with a simple crutch. Cut a strip of masking tape 0.25 inches wide (or other width, as illustrated in Live Video 08) and place it on the fabric around the freezer paper template when you cut, moving it from one side to the next as you go. When you have the sewing line marked, it doesn’t really matter if the seam allowances are precise. It is the sewing line that is important. You might be amazed by how quickly you learn to judge where to cut to get 0.25 inch, even on curves. Of course, Inklingo has more advantages than even wonderful freezer paper templates—precision corners, matching marks, layouts that use the fabric efficiently with perfect straight grain, detailed instructions, yardage requirements for any number of shapes, downloadable, etc. If you are making heirloom quilts for grandchildren, it makes sense to think about not polluting the world they will inherit. Now that you can see why acrylic templates are more expensive and less useful than the alternatives, you might want to get them out of your sewing room. Inklingo is all about making quilting more accessible but you do NOT need to use Inklingo to benefit from this information. 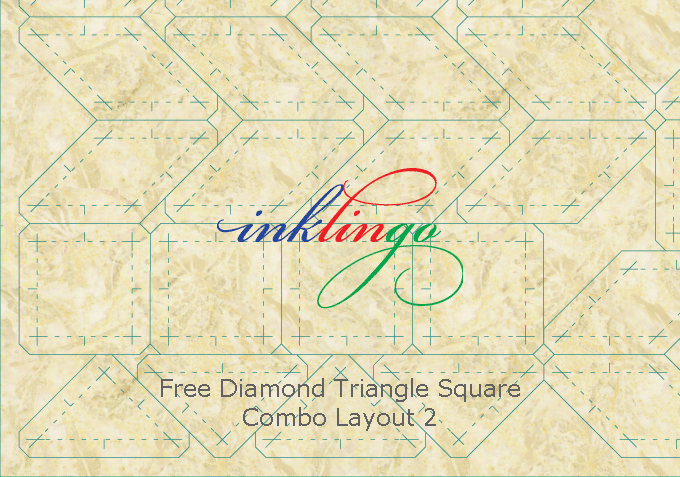 I always recommend starting with the Diamond Triangle Square shape collection ($20 value) because it includes the first chapter of The Inklingo Handbook (pages H5 – H48) and some great shapes to print on fabric. You can still buy wash boards on Amazon. That doesn’t mean that is a good way to do laundry in 2018. 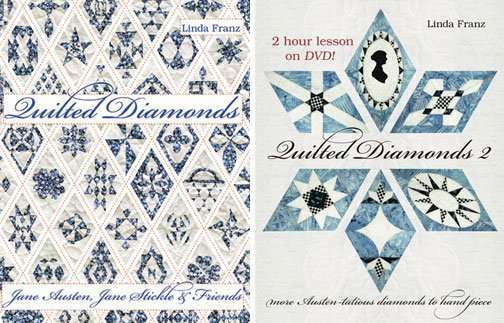 I have been teaching quilting with freezer paper templates since my Quilted Diamonds books (2002, 2004). 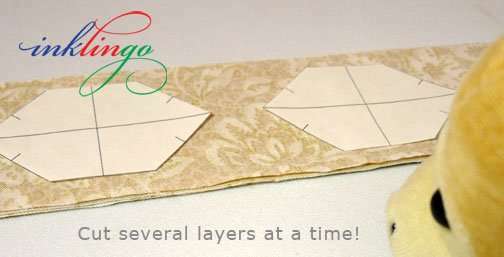 It is not new but it is a fabulous method that makes quilting more accessible no matter what design you want to make. Why does anyone still sell acrylic templates? I hope you can get some freezer paper (no affiliation) and get your creative juices flowing! You may think I am too harsh in my assessment of those who promote acrylic for everything. They can do better. Monkey says, So tell me how you really feel. Just read this article today (2/11/2019) and have been saved from investing in a set of acrylic templates for my Millefiori. Don’t know where my head was at – I forgot I could make a “window” template with my Inklingo!! I’m committed to removing plastic from my life as much as possible (pet peeve is plastic one-use water bottles). It is hard to resist plastic for storing fabric, etc., but I’m getting better at walking by all the cool plastic bins, boxes and gadgets at my favorite quilt shop. Saves me money for more fabric! My Granny did without and made gorgeous quilts. Your blogs/videos are always inspiring. Thanks again. You and I think alike, Marie. I worry about all of the things we use without thinking that will have a long term negative effect on the world for generations to come. We can do better. Thank you for writing. I like acrylic templates. They are not expensive and last forever. They suit me. I have found acrylic more accurate than freezer paper. Each to their own. I’m glad you have found a way to be accurate with acrylic templates, Sandra. Happy quilting. You and I think alike, Birgitt. Thank you. This is a great article. Thanks for speaking up – the topic is sure to make the rounds. I use both acrylic templates and I make my own. I don’t use freezer paper generally (too expensive in Australia). I have found that lightweight card can go through the printer to make my own templates. A spot of washable school glue (like Elmers) or magic tape will allow me to trace around the template and then my acrylic ruler to cut or add the cutting line. I think it’s important for quilters to know that they have permission (a.k.a. no quilt police) to make their quilts in a way that is best for them. For most quilters this is an endeavour of love to give quilts and fabric items to those we love. We should be comfortable with our process and happy with the end result. I’m sad that I can’t make good use of Inklingo due to the expense of freezer paper; but I have found that I still learn and am inspired by the content of Inklingo. This is a diplomatic and thoughtful article, thank you. I have tried your product once, which is excellent, you are to be congratulated for your inventiveness & hard work. Many Quilters I know use Inklingo too. May I make some alternative comments? Personally, for me, messing around with computers (with their endless upgrades) and printers (ink cartridges dry out quickly & cost a lot in Australia) is stressful, takes time and reminds me of the frustrations of my 20 year job sitting at a computer desk. I want my stitching time to feel relaxing! When my husband bought a Laser Cutter for his model airplane building hobby 8 years ago, I experimented with making Window Acrylic Quilt Templates for myself and a few friends. I pencil the inside edge as the stitching line and the outside edge as the cutting line, with a defined seam allowance (so I can line up the pieces and don’t have to continually check the back). Fabric doesn’t slip on sandpaper board & scissor cutting is accurate. It’s very handy for long car trips, or bringing to Quilt Guild meetings, without requiring preparation time beforehand. Yes, Acrylic templates are a “tool” but so are computers, printers & irons (which all use electricity, can break down with inconvenient regularity & don’t travel well). I do appreciate all your points, which are well made, but in the interests of promoting individual creativity and encouraging a new generation of quilters, I think people appreciate freedom of choice. I’ve promoted your website to many quilters, many of whom also like Acrylic templates for portability or for shapes larger than A4 paper. Yes, I still occasionally custom-make acrylic templates on request for hard-to-find shapes, or simply as a service to other quilters to enjoy their craft (some of whom may not have access to a printer). This enables me to work part-time from home, to fund my own fabric purchases. Isn’t there room for everyone? Thank you for taking the time to comment, Lisa, especially since you dislike using a computer. Good news. 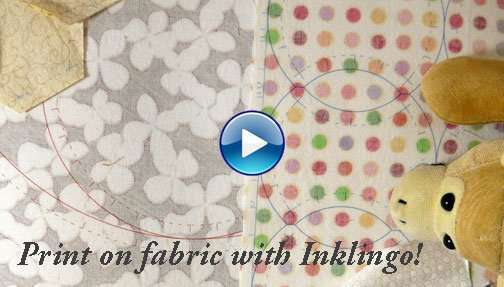 The info in this article is NOT just for quilters who use Inklingo to print on fabric/paper. It is for everyone. I am committed to making quilting more accessible, so I appreciate your interest in promoting creativity too. 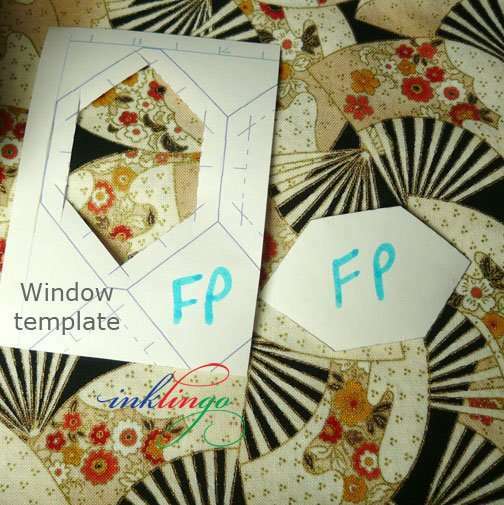 Quilters who don’t use Inklingo are better off using freezer paper templates than using acrylic for any design. There is nothing you can do with an acrylic template than you can’t do with freezer paper (and an acrylic ruler), with less expense, more accuracy and more portability. In addition, freezer paper frees the quilter to do her own designing by adding or removing lines. If you like the idea of providing your friends with templates, I know they would benefit more from a design you provide on freezer paper than from templates you cut with your husband’s machine. Your vent, Linda, was very clear and one of those AHA moments. I agree with you and love freezer paper, if only it was sold in Aussie supermarkets like the US!!! I love Inklingo and find it accurate and easy! Thank you for your clarity. Continue the great work!! What a nice reaction! Thank you, Sandy. You make me glad I went ahead and published this. My first thought, when reading this, was similar to Sandy. Until recently, “American Freezer Paper” was not available in Melbourne (Australia’s 2nd larger city), except at one special “US Foods” store in Moorabbin. Otherwise we had to buy it online from overseas stores at vastly inflated shipping costs. You are right, Lisa. I’m sorry freezer paper costs more in Australia than it does in North America but it is still less expensive than acrylic—and does more. The good news is that quilters in Australia can get freezer paper from several sources (including quilt shops) and have been using Inklingo since 2006. Of course, quilters there were already familiar with freezer paper before that. Thank you for commenting, Kathryn. It’s good to know it’s not just me who feels this way. I was making a quilt with a compass in the middle. It was a kit and came with acrylic templates, so I used them. They were quick to cut. But when I went to sew the pieces together the compass didn’t lay flat. After ripping the pieces apart and resewing it still didn’t lay flat. Frustrated and determined, I drew the compass on freezer paper. It turns out that the acrylic templates were off on the angles by just a fraction of a degree. But when multiplied by the 24 pieces it was enough to make the whole compass off. Using the finished size from my drawing was the way to go; especially if accuracy in piecing is important. I could not agree with you more, April. It is good that you found a solution. I think sometimes a quilt that is started with acrylic templates ends up being a UFO because the quilter is not happy with the results and doesn’t know what went wrong. You got it right. Extreme precision for a complex design is vital but it makes a difference even on simple designs. 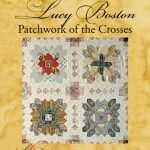 I was lucky enough to learn to quilt from a lady that demonstrated quilting at our Lincoln era town. She would only teach quilting by hand and making your own templates. 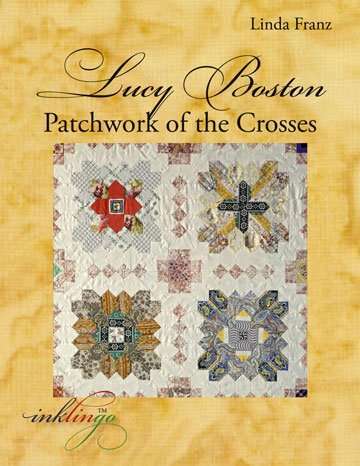 I am so thankful I learned to piece and quilt from her. You can spend as much money as you want or very little. 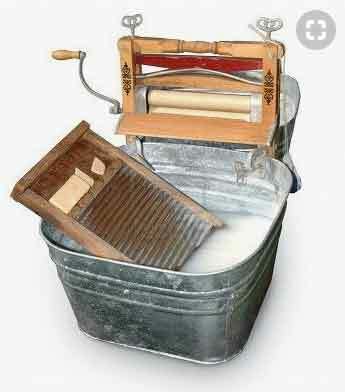 But remember that a lot of quilts were made with what was at hand. Templates were created on paper bags or cereal boxes. Fabric was old clothing or sheets. All you needed was needle, thread and a ruler. I have a quilt that my mother in law made many moons ago. It is of old jeans, blanket in the middle and flannel on the back. It is on my bed and I would be lost without it! So sorry for the saga. Just had to add my two cents! What a lovely comment, Gillian. I think you have described much of the beauty of quilting. Nice article. My only comment would be regarding the ‘cost’ of Quilting. I have purchased many specialty acrylic templates and found them worthy of the price for the project I wanted to make. I have used the freezer paper technique for hand sewing when I travel and that also has its benefits. To use Inklingo with a printer there is also the cost of the ink cartridges, which can be expensive. With all this said, as quilters we should use the method that we can afford and not be so critical of others that choose different methods. They all (paper & acrylic templates, acrylic rulers, etc.) have their purpose…only as individuals can we make those choices. Thanks for the opportunity to join in the conversation with my thoughts. Thank you for a thoughtful comment, Patty. You make good points. Personally, I would gladly pay for acrylic templates IF they did a good job but the disadvantages are significant. When something costs less and does a better job, I’m interested. Acrylic rulers are indispensable but I don’t see any advantage to acrylic templates for any design. I’m glad we see it the same way, Helen, and delighted to know that you are enjoying Inklingo too. Well said , totally agree with you! Thank you, Susan. I’m glad you agree. I have been quilting for 28 years and always use freezer paper templates as they are so accurate. Great article, especially for novice quilters who might think they need all those different shaped acrylic templates. Thank you for commenting, Suzanne. You and I think alike. This was wonderful! Thank you so very much. I can definitely tell you’re not a fair dinkum Aussie…real venting would have been a LOT stronger than that!! LOL! 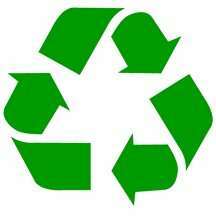 But seriously, what sensible information, especially in these days of “reduce, reuse, recycle”. Thank you from a newish quilter who is also a gadget girl. Your perspective has given me “permission” to stop buying gadgets. That is disappointing, Mary. LOL This is the second time this week that someone has used fair dinkum with me. The other time, when I helped a quilter she told me that if I was an Aussie she would say I was True Blue or Fair Dinkum. I will try harder next time. 🙂 I aspire to be fair dinkum. Linda, No need to try harder..
How lucky are we to have you! I am soo grateful to have found you (and Monkey). 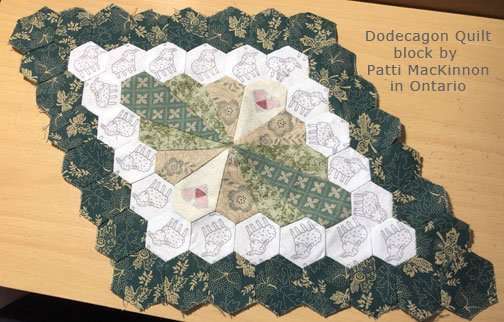 I have only done two patchwork quilts (sampler) and in both the teachers showed us how to use freezer paper and also how to create templates from template plastic. Since then (before Inklingo) I have brought some acrylic templates but never used them as they slide around too much for me, so they are in the back of the drawer somewhere. You have shown us how to make templates and how to use them in freezer paper and that is the way I would go if I needed one. We all need to vent at times, but I am really surprised that someone wants to purchase them off you as your business/hobby is Inklingo. You are a specialist in your field and special to all of us, Monkey included. You are very kind, Shirley. Thank you. I think the quilters who ask me about acrylic templates have not heard of Inklingo yet, so it gives me a chance to introduce them to it. Some of them have been conditioned to think they need acrylic templates for everything and they want to buy from the author of the book, which is a nice impulse. We are all very fortunate that you enable us to make better quilts with the use of Inklingo or, if a particular shape isn’t available in an Inklingo collection, by teaching the use of freezer paper templates.I still remember getting Quilted Diamonds and learning about the use of freezer paper templates for the first time – it made quilting so much more fun and easier. Since that day I have never used anything but either freezer paper templates or, of course, Inklingo. I cannot believe people ask you to sell acrylic templates! All they need is freezer paper if they can’t use Inklingo for some reason for POTC, but acrylic templates?? That just makes no sense at all! You and I see it the same way, Cathi. I actually LIKE it when a quilter asks about templates because it gives me a chance to explain Inklingo. Some of them have never heard of it or were influenced by all the promotions for acrylic templates and wanted to buy from the author instead of someone else, which is nice. The quilters I worry about are the ones who don’t ask, as usual. I am fairly new to quilting which I only took up on retirement five years ago. However lucky for me my first learning class at a local college was by a wonderful teacher who was adament we only needed needle thread scissors & any sort of fabric to start oh and cereal packets & a class roll of freezer paper & class ruler was useful. This was a low cost class for mixed incomes. She taught us so many techniques … low cost without many tools that many store classes insist on. I now pick any classes very carefully – having learnt how to make my own templates. Sometimes there is a need for something more substanial however I don’t understand how the acrylic templates seem to have overtaken the individuals design process. I’m glad you had such a good experience with a responsible teacher, Sue. Quilt on! I am fairly new to quilting which I only took up on retirement five years ago. However lucky for me my first learning class at a local college was by a wonderful teacher who was adament we only needed needle thread scissors & any sort of fabric to start oh and cereal packets & a class roll of freezer paper & class ruler was useful. This was a low cost class for mixed incomes. She taught us so many techniques … low cost without many tools that many store classes insist on. I now pick any classes very carefully – having learnt how to make my own templates. I’m glad you had such a good experience with a responsible teacher, Sue. You are off to a great start and years and years of creativity. Linda, you are so right! I agree with you and your rant! I love cutting with scissors, I just feel so much more accurate and your system has made my quilting life easier and accurate to say the least. Now if I could just make ink last longer! Lol! Thank you for your support, Bernie. I wonder if your ink is drying out between uses. Inklingo uses a tiny amount of ink. You could probably print all the shapes for a king size quilt with less ink than you would use printing just a few photos. Cost of ink is not something I normally hear about. Hi Linda, I totally agree with you! I saw Cinthia England’s show about picture piecing and she even has a great system for her work! Brilliant job!!! Thank you, Linda. I’m glad we agree. I appreciate your comments. I personally use freezer paper when cutting pieces for a wool project. When hand piecing, I love the sheets of template plastic cut to the finished size. Sewing on the line is more accurate. I have reused and cut new shapes from old template plastic, too. Old habits die hard for a 1980’s quilter! I usually make my own hexies for EPP from index cards. 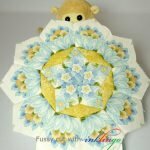 My one indulgence with acrylic templates is for a Millefiore quilt. But you are right about the unnecessary acrylic templates. I would gladly pay for acrylic templates for any design if I thought there was any advantage but the disadvantages are too much. For hand piecing, I always use freezer paper templates in the finished size. I cannot find any advantages to using plastic sheets or the unfinished size but I am glad it works for you. The important thing is being creative. I am so happy you finally called this as it is. You are so right and as others already said I too thought I was the only one who thought this way. Thank you. Thank you for the support, Ruthie. I appreciate it. You have a way with words, Wendy. I like “the antidote to creativity” to describe acrylic templates. You make me happy that I finally published this article. Thank you, Betsy. You make me glad I published this article. I hesitated a long time. I totally agree with you, using the sewing line is the best way to go. I have noticed that sometimes freezer paper shrinks a little so it’s a good idea to iron it once before using it as a templet. Thanks for all the great information. Thank you, Diane. I haven’t had a problem with freezer paper shrinking but I never use steam, so that might be the difference. Ironing it first can’t hurt because we can use freezer paper over and over and over again. It doesn’t use it up at all. Wow….So people actually have the nerve to say to you: “Gee, thanks for inventing Inklingo and all the great free advice, but actually, can’t you sell me something more pricey, and much less useful? I would much rather have something which actually takes up space in my home, takes time to ship, and is a waste of resources in every way I can think of.” Wow… I am so sorry for you, and for all the quilters who don’t realize the full potential of what is right under their noses. You are too funny, Annika. I actually LIKE it when a quilter writes with a question like this because it gives me a chance to explain Inklingo. Some of them have never heard of it or were influenced by all the promotions for acrylic templates and wanted to buy from the author instead of someone else–a nice impulse. The quilters I worry about are the ones who don’t ask. I am glad you said this as gracefully as you could. I would like to give you an ounce of perspective. I use them because I have a few issues. I can’t see like I used to, and the templates allow me to use a rotating mat [that I made myself out of wood, in 2 sizes], and cut around all 4 sides without moving the fabric, or template, in a position that works for me. If I have to draw or trace a pattern onto fabric, I would need my reading glasses, and then have to bend over the table to get close enough to see, since reading glasses only work at certain distances. Of course bending over is also an issue since I shouldn’t be doing it. I tried many things before deciding to use templates for almost everything. I actually do make some of my own from cardboard, if it is a design I only plan on doing once. Thank you for letting me give you a peek at my world, if only because I’m not the only one for whom templates help keep in the game. I’m glad you have found a method that works for you. I have vision problems too, so I can relate. One of the most gratifying things about my work is that I frequently hear from quilters with disabilities who tell me they would not still be quilting if not for Inklingo. That includes quilters with vision problems and quilters who cannot rotary cut anymore because of bad wrists, knees, or eyesight. Some quilters cannot sew by hand anymore and some cannot sew by machine anymore but they still have the creative urge and find a way that works. I encourage anyone with vision problems to try Inklingo. It could set you free to make the quilts of your dreams. Great memories, Patti. I learned about freezer paper templates from Mary when I was making my Dear Jane too. 🙂 That was January 1997. Amazing how time flies. I have a problem with any claim that one method is right or wrong. Each method has its advantages. I use freezer paper and I use templates, depending on what I’m making. 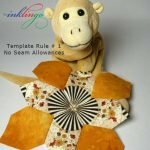 Yes, templates can be expensive, but your patterns can get pricey too. Chill out! I agree, Debby. There is not ONE correct way. Sometimes Inklingo, sometimes freezer paper templates, sometimes no templates at all. I love using some acrylic rulers but acrylic templates have too many disadvantages. I would gladly pay the price if they did a good job. There is nothing an acrylic template does better, imho, and I used this article to explain why. I understand your point of view, but I still love my acrylic templates for EPP and have no plan to get rid of them. Of course the designers are making money from the sell of them, that is what free enterprise is all about. I still use the print on back of fabric method that Inklingo was made for because there are some shapes that just dont work very well with EPP. That being said, everybody has their own favorite way of doing things and different techniques call for different tools. Happy stitching everyone. Even if I thought it gave me a good result in a reasonable amount of time, I wouldn’t use acrylic to cut the fabric but I’m glad you have found a method that works for you. As far as free enterprise goes, the smart designers can make more money selling Inklingo than acrylic, so that’s good news too. Well said!! And, even when you are venting, you are still most gracious with your words! You know how to make me feel good. Thank you, Lorraine. I found your post a little upsetting but only because I can’t believe that people actually ask you if you sell acrylic templates… AFTER ALL THE VIDEOS AND HUNDREDS OF TOOTS AND BLOG POSTS YOU MAKE… in fact, I have one complaint… there is too much information on all your channels, blog, website that it makes my eyes go boggly, seriously, sometimes my little brain can’t keep up with all the help you give. YOUR WAY is the best way, seriously, it is the only way. I have so many acrylic templates that either came with a pattern or book OR I actually ordered separately, some before I KNEW Inklingo and a few AFTER but only because I had been to lazy to check out and do the Inklingo patterns I had already bought. Either way, I have loads and you’re so right, I was so stupid and naive. I agree with everything you say and didn’t say but I’ll say it for you… acrylic rulers are way to make money off silly ladies like me and pollute this beautiful earth. I personally have a harder time with the fussy cutting and the freezer paper templates… but only for a few minutes because all I have to do is sift through the enormous library of help you have set up and then I waft into the OH YES THAT’S RIGHT mode! 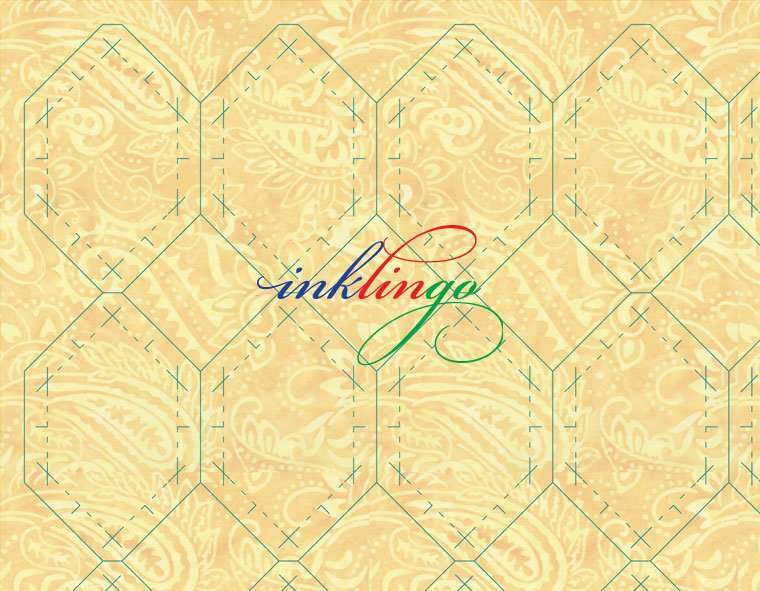 INKLINGO is for quilters what Alexander Graham Bell is to Apple and Samsung! Don’t sweat it girl, you’re right to vent and people are still learning. Once they try Inklingo either printing or freezer paper templates, they will never go back. Just before I go, I must say to new Inklingoers, yes, the secret is actually in the SEWING LINE, not the dots on the acrylic templates which somehow makes the corners never quite match up. Take the RED PILL and set your mind free from all the usual palaver you get force-fed when learning to quilt. You know how to make me smile, Conchita. Thank you very much! You put into words what I was “feeling”, and getting anxious over. I looked around my sewing spot and the “junk” I had collected for quilting, made me ill. It may be great to buy acrylic templates, but in all honesty, will we ever make more than one quilt with them? What a waste of money [I’d rather have the money for fabric,] and space! I would rather have fabric too. 🙂 Acrylic templates are a waste even if you intend to use them over and over again. There are BETTER methods that cost LESS. Better for less is great combination! You make me happy that I decided to publish this article. I hesitated a long time. It is very good to know that it helped you. Thank you. I totally agree Linda, you said it well and was not ‘harsh’ but ‘truthful’ in your assessment of the templates….we must give credit where credit is due, templates are a way for a designer to make more money, you on the other hand are more interested in teaching people to quilt and with an inexpensive method, modern society doesn’t go for that….it is driven by the love of $$. Thank you, Carole. I think many of us would gladly pay the money if acrylic templates did a good job but they actually make every step worse, from designing to sewing. I don’t think every designer recommends acrylic, but I do know some designers who do and that’s mainly because they are promoting something to sell that they possibly will earn money off of. I for one feel the same as you, I would never use acrylic when freezer paper is very available and easy to use. While I wouldn’t be as likely to use freezer paper on a block that is standard, such as a square, or a triangle or something I can rotary cut and use a ruler with, I would use freezer paper for applique and fussy cutting. It’s good to remind quilters that they don’t really need acrylic templates your never going to convince a designer who does sell them that they aren’t otherwise needed although I’d be willing to bet that she too already knows that. Personally, I feel the very same way about specialty rulers especially for a project I may only create once. You are so right, Marian. A few acrylic rulers in different sizes will often do the job without any templates at all but when templates are a good idea, freezer paper templates do a better job than acrylic. I agree with your comments. So many of the acrylic rulers are just redo’s of previous rulers. Some are so limited in their use and so pricey I really wonder why people buy them. I will admit that I do have a number of rulers but most I have bought at thrift shops. It pains me greatly to have to consider full price!!! I have a couple that I REALLY do use but most just gather dust!!! Thank you for commenting, Cynthia. I agree. There are a few acrylic rulers that are well worth the price. Acrylic templates are not worth it and actually have a lot of disadvantages. Great article! I’m going to try to share it with my whole guild. I’ve used inklingo and also templates and also drawn up my own designs. But I really like your idea of going back to freezer paper and being free of the tools! Thank you. Thank you, Terri. I hope you will share the article with your guild. It is good info even if quilters don’t print. I am so glad I can across your blog and Inklingo. You have given me confidence to do my own designs and attempt designs I would never try because of EPP. I am learning so much from you. Thank you. I can’t get my quilting buds on board yet. I have to say I love my Stripology ruler to cut strips fast and accurately. Thank you for telling your buds about Inklingo, Linda. There are a few acrylic rulers I love using too. Acrylic templates are the problem–extra expense for no benefit AND make it more difficult to be creative. Amen, Sister!! Glad to see someone finally calling this out. I thought I was the only one with this opinion. I use freezer paper all the time and love it. Thank you for speaking up, Mary. We are kindred spirits.